I&apos;m not a psychologist or even a TV talking-head shrink. So I don&apos;t know why some people have identity crises. But I do know why I have an identity crisis. It&apos;s because I have a motorsailer. There&apos;s been a lot said lately about this kind of boat, but nothing&apos;s been said about what it&apos;s like to cruise and live on one if you&apos;re like me and have a well-deserved inferiority complex to begin with. If you&apos;ve got a sailboat, you&apos;ve got a pretty good idea of what you&apos;re about, and so do most other people. The same thing goes if you&apos;ve got a powerboat. And within those two generalities, your identity can be even more acutely defined by your type of boat. It&apos;s pretty easy if you have, say, a Sea Ray or a J/Boat, a Hatteras or an Island Packet. You probably know who you are. Me? I have what a lot of folks consider to be an "in between" boat, and I don&apos;t seem to fit into some folks&apos; notches. Take bridge tenders. Many bridges open on schedule. You&apos;re supposed to be at the bridge at a certain time in order to get an opening. 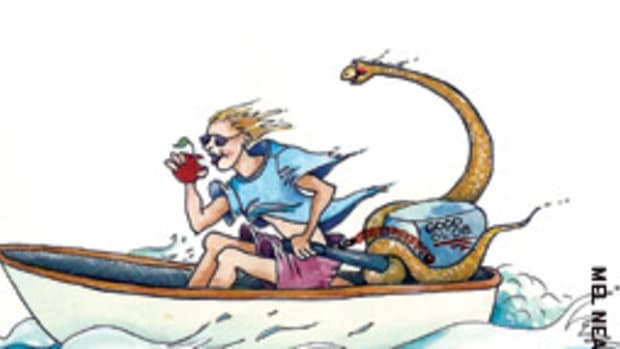 Getting anywhere on the water by a certain time is an oxymoronic concept, but, as I see it, county and state DOT bureaucrats don&apos;t have a very good record of reality checking. Neither do many bridge tenders. When they see me coming, all they see is those two sticks reaching from my deck toward the sky. They think I&apos;m a sailboat. So when I call on the VHF and say I&apos;m the southbound motorsailer and that I&apos;ll be there for the 2:30 opening, there&apos;s a pause. And then the bridge tender comes back and says, "The only boat I see to the north is that sailboat. 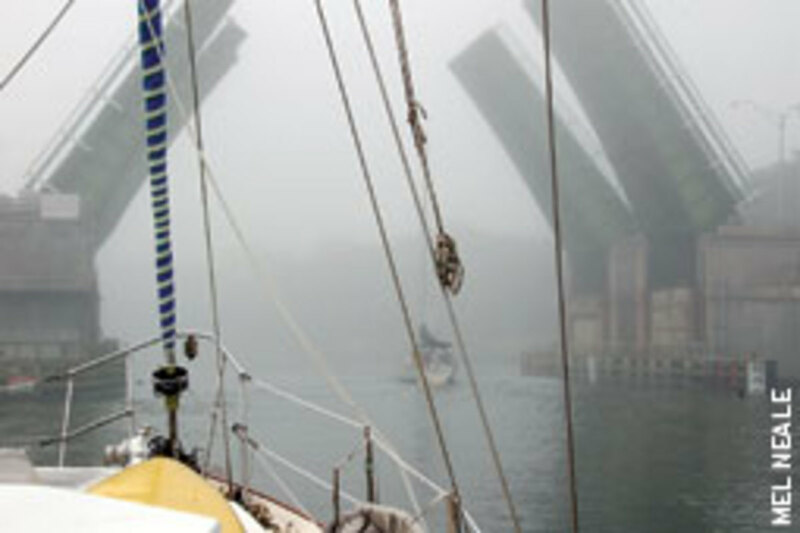 There&apos;s no way that sailboat is going to be at this bridge by 2:30." Then I have to explain, as succinctly as possible, that, yes, you are looking at me, but I&apos;m not a sailboat; I&apos;m a motorsailer, and I can go a lot faster than your average sailboat, and I will be at that bridge by 2:30, if not before. Then he&apos;ll typically say, "Well, no sailboat&apos;s gonna get here that fast, and I won&apos;t open the bridge for you unless you&apos;re at the half-mile mark." I don&apos;t even try to explain that a half-mile mark is completely irrelevant to him doing his job because different boats move at different speeds. Instead, I say something like, "I&apos;ve got two GPS/chart plotters and radar, and they all say I&apos;m going to be there no later than 2:20, so please open the bridge at 2:30 for your scheduled opening." The typical response is often silence ... total silence as I&apos;m barreling down the channel at up to 10 knots, which is well more than 11 mph. Surely, I think, this guy can see that I&apos;m closing on him a lot faster than the 5 or 6 knots of your average sailboat. I think this until I see that he&apos;s walking out of his bridge house and sauntering down the road, obviously not getting ready to open the bridge. Then I have to slam on the brakes. Of course, you don&apos;t really slam on the brakes in a boat. It&apos;s one of those things about being on the water. And with my motorsailer you really, really don&apos;t slam on brakes. She has a nearly full keel, carries 300 gallons of water and 335 gallons of diesel, has a chunk of ballast, a 200-hp Yanmar and a 12-kW generator - plus most of our stuff because we live aboard. She&apos;s not a nimble sailboat. It&apos;s like trying to stop a freight train racing down the mountainside on greased rails. So I throw her into reverse and watch the water broiling around her sides as she ponderously loses way and stops a few feet short of the bridge, well before the 2:30 witching hour. And then I begin an awkward hour or so trying to hold her in place, which is very difficult in a large single-screw motorsailer if the wind is blowing, the tide is ripping and the banks are close. Usually I have to anchor, if I&apos;m lucky enough to have sufficient room. Then the fast boats arrive for the next opening. They seldom talk to me, but I get the feeling they think I&apos;m anchored because I&apos;m too cheap to buy enough fuel. (How did they know?) Then the fleet of trawlers arrives. They easily hold in place with their two engines and invariably one or more of the skippers will say, "We went through the last bridge with you. How&apos;d you get here so fast in a sailboat? What&apos;ve you got in that thing? A 200-hp motor? Heh, heh, heh." Then the sailboats begin arriving. With their counterbalanced rudders, modern keels and reversing props, they nimbly circle around, their skippers having not a care in the world while I feel like I&apos;m sitting on an elephant getting ready to stampede in a china shop. And the folks on those sailboats usually wave and maybe say something like, "That&apos;s a really nice sailboat you have there, but when you passed us you threw a wake like a trawler." And this brings up another identity crisis issue: the overtaking problem. 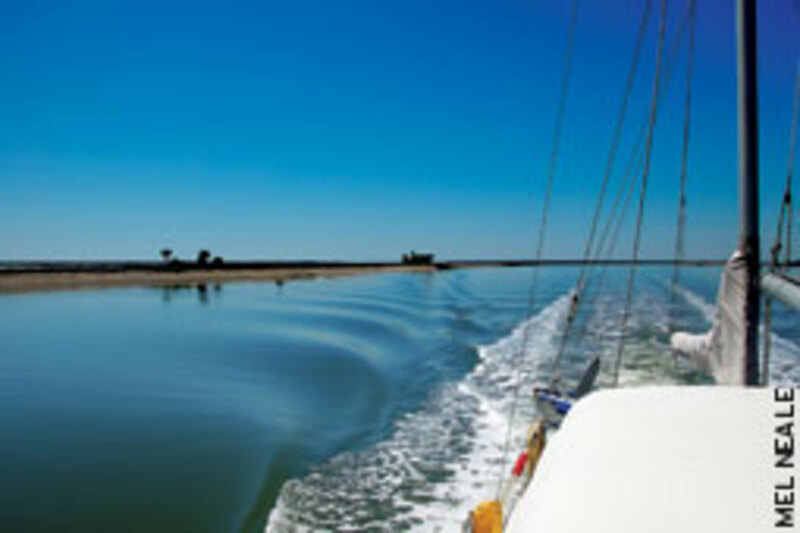 In many parts of the Intracoastal Waterway the channels are relatively narrow and the sides steep. There may be plenty of room to pass, but there&apos;s also plenty of need for courtesy. I never want to make a wake when I pass anywhere near another boat, because most people don&apos;t like it. I don&apos;t either. I never want to overtake close to another boat. I always want to get around a boat I&apos;m overtaking reasonably quickly because I know that the other skipper and I will be a bit more relaxed when the maneuver is completed. I also know there&apos;s less likelihood that a shoal will come jutting into the channel somewhere ahead or that another boat will suddenly appear steaming from the opposite direction. But we all must overtake sometimes. Just because someone is traveling at 5 mph doesn&apos;t mean everyone else going down the ICW should be stuck at that speed all day. For most folks this isn&apos;t a problem. For someone with an identity crisis like mine it can be a big problem. Typically, you call the boat you want to overtake on the VHF and ask to come around on one whistle or two. Also, you suggest that if the skipper being overtaken will slow down, you can get by him at a much slower speed than you&apos;re traveling and, therefore, will not throw a wake. 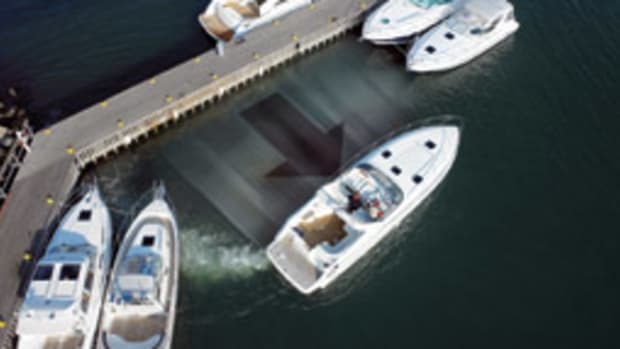 Wakes in narrow parts of the ICW can be an issue because you must pass relatively close to the other boat and because of the steep channel walls. So most skippers appreciate this prearranged courteous type of overtaking. And with most skippers who want to overtake, none of this is a problem. But when I call a sailboat, occasionally there will be a skipper at the helm who will look back and see that it&apos;s "another sailboat" trying to overtake them. I guess this is seen as an insult. Sometimes he won&apos;t even answer on the radio. So I&apos;m thinking that he&apos;s probably thinking something like, This guy must be some kind of a jerk trying to come around for an extra quarter knot of speed. Like, maybe he thinks he needs to reach the next anchorage 10 minutes before I do. So I&apos;ll give the horn signal as in the Nav Rules. Frequently when I do this, the guy will look back, scowl, offer no communications and speed up, the result being that he&apos;s only going 4 mph slower than me rather than 4.5 mph slower. Sometimes he will reply and say, "Oh, you won&apos;t bother us, just come on around." And he won&apos;t slow down. Sometimes he will speed up right when I&apos;m off his beam, trying to go as slow as I can and still get around so that I won&apos;t wake him. So here comes Nice Guy Neale (or so I like to think) powering around and throwing a wake, feeling like a snake as all eyes on the sailboat widen and folks start diving for their coffee cups. If I&apos;d been a trawler or a sportfish I&apos;d have no problem. Everybody knows what they are and what they can do, and most people with any sense agree to slow all the way down. And when the overtaking is done, everyone smiles and waves with all digits extended rather than just the middle one. And then there are the trawlers I need to overtake. 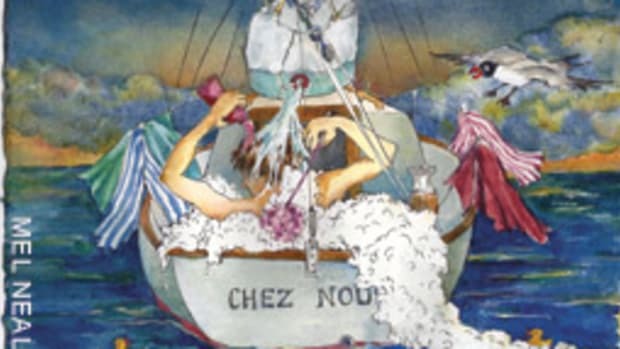 Chez Nous the "sailboat" travels considerably faster than many of them. Actually, Gulfstar built some trawlers from the same hull. But us? We&apos;ve got those sticks. We don&apos;t belong in that set either. Sometimes when we call a trawler to arrange an overtaking situation, the skipper looks back and down from the flybridge, laughs and says something to his or her mate that I&apos;m thinking (as I&apos;m hunched down in my lowly cockpit) must be something like, "Who does he think he is? What a joke. A sailboat wants to pass moi?" At which point the trawler will sometimes try to speed up a half knot or so. So after giving appropriate whistle signals and waiting for the appropriate response, I&apos;ll come on by. 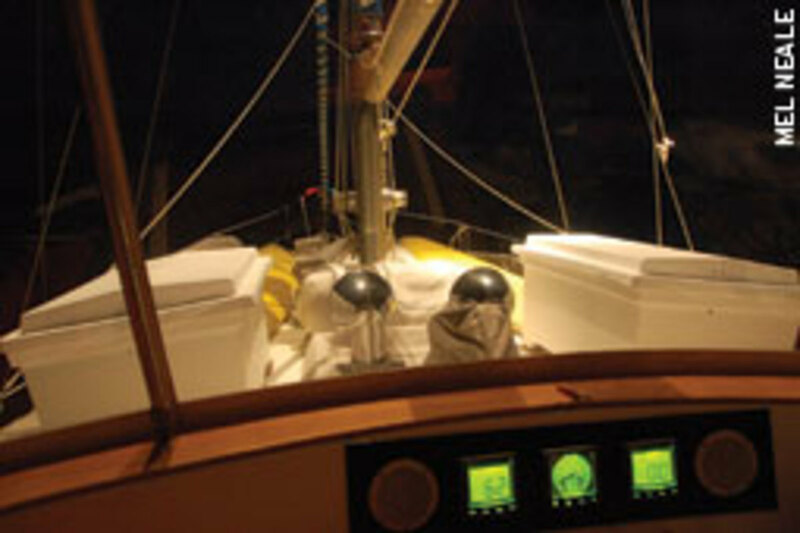 As I get alongside, eyes widen, mouths drop and commands start flying to secure the decks and turn on the stabilizers. And once again my self esteem plummets to new lows as my personality schism opens to new widths. Of course, I&apos;m not in the ditch all the time. I try to get out to sea as much as I can. 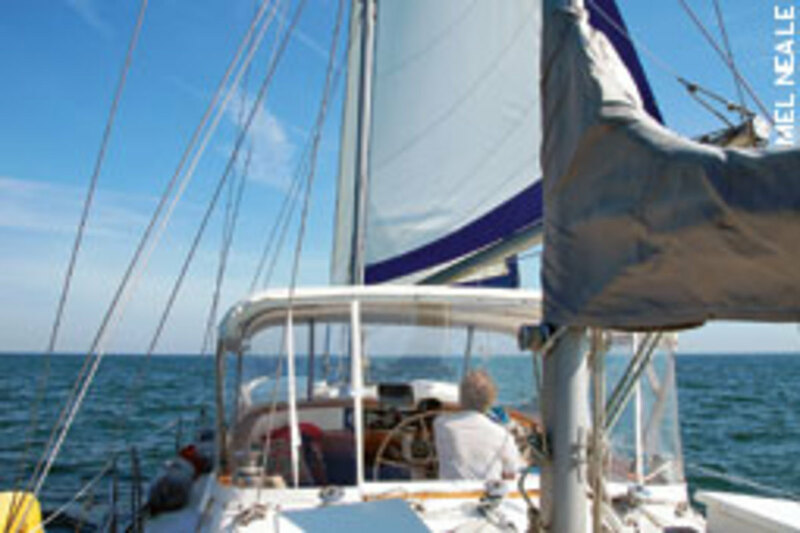 Chez Nous, in a fair wind with sails up and the Yanmar purring, romps along doing what she loves the most: motorsailing. It&apos;s what she was built for. It&apos;s beautiful to behold. And it&apos;s the way I like to travel when I want to go from Point A to Point B in a single lifetime, rather than trying to tack back and forth for several lifetimes. The world is beautiful. I feel like I know who I am. But even out in the vast, open, lonely ocean I soon encounter problems. One of the bad things about the GPS is that you&apos;re seldom alone on the ocean for long when you&apos;re traveling between popular destinations. If you&apos;re going from any common destination to any other common destination, chances are you&apos;re going to find a lot of other boats. For example, if you&apos;re running from the Miami sea buoy to the Lake Worth sea buoy, you&apos;re going to be following an invisible line that&apos;s been written in stone by your GPS as being the shortest route. And so is everybody else who is going between those two sea buoys. It used to be much easier. We&apos;d all just wander around out there figuring out where we were by compass and dead reckoning. The trips took longer, but at least we had a little more privacy. So every time I head from one sea buoy to another, I know I&apos;m going to have to deal with the same old thing. For example, there&apos;s always going to be a sailboat that left much earlier than me and I&apos;m overtaking. Of course, I give it a very wide berth, even daring to take the autopilot off the GPS navigation, and steer a diversionary course for a while. But I forget one critical thing - most sailboaters are always racing other sailboaters, even if they don&apos;t know they&apos;re doing it. When I had pure sailboats (and I&apos;ve had many) I&apos;d never let another sailboat gain on me without tweaking the sheets, messing with the boom vang, looking for gusts and anything else I could think of to pick up a little more speed. Now, as I&apos;m happily motorsailing along, I see the guy in the sailboat furtively looking over his shoulder at me every few minutes. And in between glances he&apos;s tweaking just like I&apos;d be doing if I were him. Pretty soon, as the distance rapidly closes, his tweaks reach the stage of desperation. Finally, as I begin to come abeam of him, I see him raise his binocs. Then he calls up his mate as a witness and points to my stern, where the exhaust is trailing out. And I know what he&apos;s thinking, because I&apos;ve thought the same thing: Aha, I knew something was wrong. He&apos;s not sailing better than me. That son of a beach (bum) has his motor on. He&apos;s cheating. And, crouched down in shame behind my pedestal, I steam away, my exhaust marking my ignoble trail. In self-inflicted sessions of self-psychoanalysis, I&apos;ve considered various remedies for my problem. I could just turn the motor off when I&apos;m at sea and travel under sail alone. But that would be like using a Cadillac to pull a plow. My boat can "just" sail, but she&apos;s made to motorsail. And she does it beautifully. And I love her feel when she&apos;s doing what she does best. I&apos;ve also thought about just motoring, but in the ocean, when you leave the sails down, you don&apos;t get that beautiful feeling of the push from the wind, and you don&apos;t get the benefit of those free low-tech white stabilizers above your head. I&apos;ve also considered what many fellow cruisers have told me, in sincere earnest: "Why the heck do you want to go that fast? You&apos;re supposed to be cruising. You&apos;re supposed to be going slow. You&apos;re not supposed to be in a hurry. You&apos;re supposed to be laid-back and enjoying it." They&apos;re absolutely right, of course, except they&apos;re wrong about what works for me. First of all, I am [italic am] enjoying it. And secondly, in the real world of cruising, you have schedules whether you like it or not - even whether you know it or not. I&apos;ve been living aboard since 1979, and cruising for much longer than that. And in that time, I&apos;ve noticed a few things. It&apos;s not that I&apos;m in a hurry; it may be that I know I need to make certain speeds for safety reasons or for simple, laid-back convenience. For example, it may be that I want to reach the next anchorage before dark, and I know how far away it is and what the currents are going to be doing between here and there. There&apos;s nothing relaxed or laid-back about standing on the bowsprit trying to pierce the blackness with a spotlight, yelling back and forth to your wife who&apos;s having to give 200 percent of her concentration to the danger beeps from the depth finder and trying to figure out whether all those targets on the radar are a rapidly approaching fleet of bass boats or extra-fat seagulls. Also, I may be figuring that if I don&apos;t make that next bridge by 3 o&apos;clock I&apos;m going to miss a bridge down the way that is going to go on its regularly scheduled rush hour lockdown from 4:30 to 6 o&apos;clock. And then I&apos;ll be running in the dark for a long, long time. Or maybe I&apos;m noticing some misty fog beginning to rise from the warm water in the chilling late-afternoon air, and I&apos;m really anxious to reach that next anchorage as soon as possible. Or I might be worrying about the fact that if I don&apos;t get through a certain creek by high tide, I&apos;m going to have to wait for high tide the next day. And by that time a nor&apos;easter will be brewing and I won&apos;t be able to get out into the ocean in order to get around an ICW bridge that&apos;s going to be closed for construction for a whole week. And while out in the ocean, I may be thinking of that storm closing in by late evening and knowing that I need to reach what is the only safe inlet for hundreds of miles before the storm, and knowing that if I reach it during an outgoing tide with the sea that&apos;s already running I&apos;m going to have a really nasty ride through the jetties. There are a lot of little things like these little things that dictate how I run my boat. But this difficulty manifests in more situations than just overtaking and racing bridges. When I pull into a marina (which isn&apos;t often) I find that the dockmaster frequently wants to put me on a "sailboat dock." Although I&apos;m not sure why some marinas would have sailboat and powerboat docks, this is fine with me. I&apos;ve been a sailboater all my life. I&apos;ve also been a powerboater all my life. I&apos;m like a hound dog on a deer hunt. I like everybody. 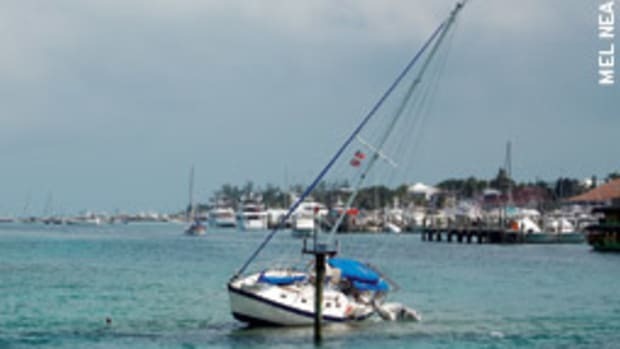 But a lot of times my boat doesn&apos;t want to go to the sailboat dock, because it&apos;s not designed to wiggle into tight places. Like I said earlier, she doesn&apos;t have all those wonderful design advances such as counterbalanced rudders and fin keels and reversing props that&apos;ll allow her to spin on a dime and back like a car. Out at sea she romps along like the thoroughbred she is, but in tight marinas she&apos;s like a rhinoceros in quicksand (or maybe it&apos;s her driver). So I have to explain this. I have to say that although I look like a sailboat, I&apos;m a motorsailer and I might need a little more wiggling room. Then they put me at a powerboat dock. Sometimes all is well. But sometimes, particularly when I&apos;m in the middle of a bunch of sportfishing boats, I start feeling like I&apos;m a ballet dancer in an NFL locker room. 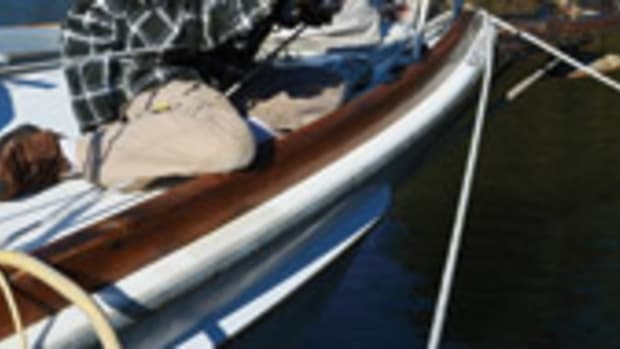 First of all, I notice that my pointy end is into the dock, while everybody else has their broad, varnished, teak-trimmed fishing/party sterns up to the dock. Then I notice my mud-caked anchor is hanging over the dock, while nobody else has any mud on their entire boat. And I notice that I have to climb aboard way out on the finger pier, while everybody else has a nice door in their transom so they can just walk ashore from their spacious lounge with wide-screen TV. I try to fit in and do something nice. 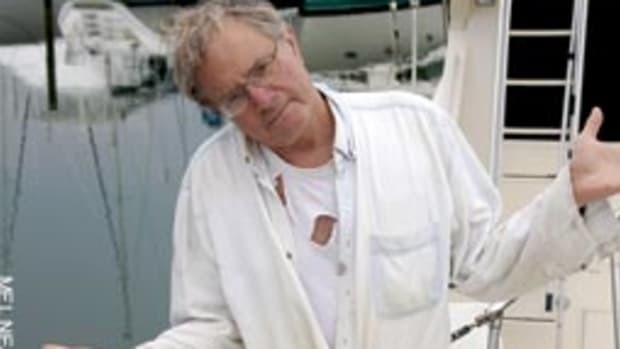 When the next sportboat starts backing in, I offer to help them fend off as they come alongside, but somebody on the flybridge does an absolutely masterful job with the twin powerhouses and brings the boat alongside with perfection, except that I get salty spray all over my face and glasses because I was standing in the wrong place. I try saying things like, "Throw me your line," but usually nobody looks at me, and someone half my age with 10 times my agility jumps to the dock with lines, power cord and TV cable ready to rock and roll. So I retreat to my cockpit and clean my glasses while two or three people spend an hour hosing and washing the boat and drying it with chamois cloth. I sit there feeling left out as their evening social hour begins, wishing I had just a tiny corner of that expensive chamois cloth to help me dry my glasses. But as I think back, I realize that my maritime identity crisis probably precedes this motorsailer thing. 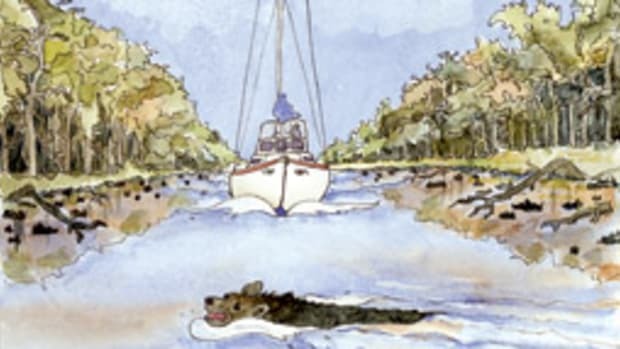 My wife (of 42 years) tells me that when she and her family used to cruise Chesapeake Bay on their fine 40-foot Matthews yacht, she, as a young girl, remembers occasionally seeing a very grubby teenager on a half-rotten skiff with a homemade plywood shack screwed to the bow and an ancient, beat-up outboard dangling from the stern. She said this dirty, oily looking kid with his boat smelling of gas would pull into the fuel station of a certain fancy high-class marina where her family often docked with their yachting friends. The boy would fill numerous assorted jugs with gasoline, buy a few supplies and head out again to anchor in some marsh creek with the mosquitoes. She said that some of the marina patrons would look down from their flybridges with some disdain, commenting over coffee or early cocktails that this was some weird kid who was frequently seen bumming around all over the Bay in "that" boat, but that nobody knew much about him. They opined that it was very kind of the fancy marina to sell gas to "that" kid in "that" boat. Their kids would listen to the grownups, look curiously at the weird kid for a moment and then head back to their fancy marina pastimes, such as sunning by the pool. She told me that this kid was me. And you know, I never even noticed that they were looking at me. I thought we were all simply having a good time in our boats. I didn&apos;t think about the fact that they were doing it their way and I was doing it my way. I didn&apos;t have constant reminders of who or what I or my boat was expected to be. I very seldom came into a marina, even to get gas. And in those days I didn&apos;t have to worry about opening bridges. And I didn&apos;t have to worry about slip assignments in marinas. I couldn&apos;t afford to tie up, and if I did I could always row into a tight corner. And I certainly didn&apos;t have to worry about overtaking. There weren&apos;t many boats out there and no one had even imagined GPS. Things are different now, but I can&apos;t say that it&apos;s bad. Today, I cruise on a wonderful boat that in many ways is like a little ship. I always dreamed of doing that when I was knocking about the Bay with my wet feet in the oily water sloshing across the bottom planks of my old skiff. I love my boat. I&apos;ve also had sailboats, rowboats, skiffs with outboards, powerboats, kayaks, inflatables and a log canoe. Some of my boats have even been unkindly referred to by friends and neighbors as submarines. I&apos;ve loved them all. We&apos;re each defined in at least some small way by our boats, just as we help to define those boats. So even though there are a few skippers and bridge tenders out here who don&apos;t know what my boat is, I know my boat - and I know myself. So I&apos;ve solved my identity crisis. Now, the inferiority complex. All I need is a few million dollars of TARP money to buy a megayacht. 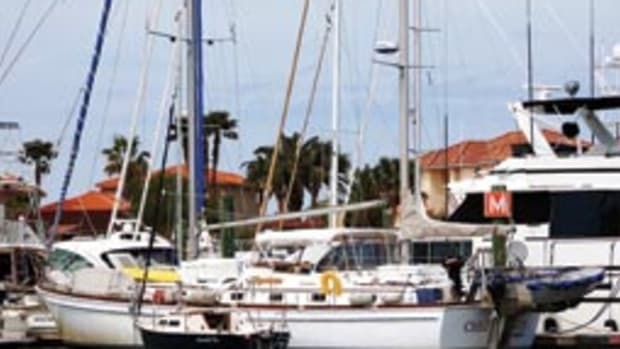 Tom Neale is technical editor for Soundings and lives aboard a Gulfstar 53 motorsailer. You can buy his book, "All in the Same Boat," at www.tomneale.com. This article originally appeared in the March 2010 issue. Outboards: What would I do without 'em?